Dr. John Hancock and our experienced team of medical professionals have been providing top notch, all natural pain & injury rehabilitation to residents of Illinois for over 30 Years! Spinal decompression therapy is an amazingly effective, non-surgical treatment modality for low back pain, herniated discs, neck pain, chronic headaches and more! Dr. Hancock works with amateur and professional athletes to provide comprehensive and customized rehabilitative programs to get them back onto the field of play without surgery or medications. Hancock Chiropractic Center practices the “Natural First” approach to treating patients with chiropractic care and injury rehabilitation. We help patients with an array of conditions including back pain, neck pain, disc injuries, headaches, arthritis, and more! Effective chiropractic & injury rehabilitation services such as laser therapy and spinal decompression will help you heal naturally. Take the next step toward living a healthy, pain free life and call to book your appointment with Dr. John Hancock today! Dr. John Hancock is a renowned chiropractor in Paris, Illinois helping patients with back pain, sciatica, neck pain, shoulder pain, headaches, sports injuries, and auto accident injuries for over 3 decades. Dr. Hancock graduated with honors from Logan College of Chiropractic in 1986 and his commitment to patient care is second to none. Hancock Chiropractic serves the local community and beyond. Dr. Hancock has served as the Sports Physician for the high school and he is a member of the Illinois Chiropractic Society, American Chiropractic Association, and he is a Kiwanis member. Chiropractic adjustments, spinal decompression, cold laser therapy, and rehabilitative exercise protocols are some of the therapies offered. For most patients with disc herniations, research shows that natural chiropractic solutions are an effective alternative solution to surgery. Call Hancock Chiropractic Center for a consultation and start feeling better today! Why Choose Hancock Chiropractic Center? 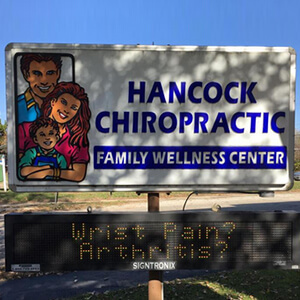 Hancock Chiropractic Center has been helping patients feel their best for over three decades! We take most insurance and will answer your questions about coverage. Dr. John Hancock is experienced with working with athletes for best results in performance & injury rehabilitation. He is a leader in the area and patients come from a distance for his expertise. Our family chiropractic office in Paris, Illinois sees patients for back pain, sciatica, neck pain, shoulder pain, headaches, sports injuries, and auto accident injuries. Chiropractic care helps the body heal naturally. Spine health affects the body’s nervous system which in turn controls almost everything in the body. We are available to answer your questions for optimal health and performance. Call Dr. John Hancock’s office for excellent patient care and for results that will put a new bounce in your step!